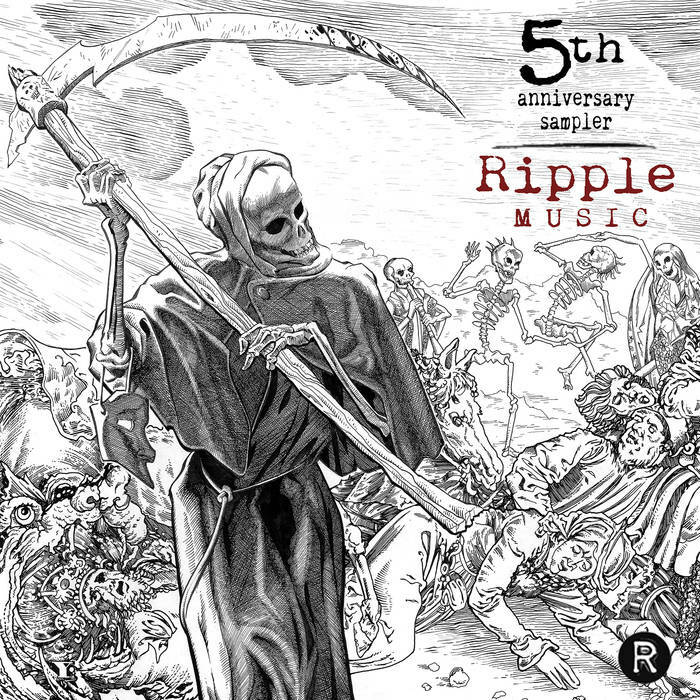 Ripple Music Celebrates its Fifth Birthday this month and announces the release of free downloadable 5th Anniversary Sampler. Sometimes you discover a record label that has every artist you have ever wanted to hear on their roster and only ever release the best in music. Being one of those rare labels in the world that actually care about what they release, with both the music and their artists being of an exceptionally high calibre, every new offering from them is a delight to hear. Ripple Music is our favourite label and you know every release is a record that is awesome, as they don’t do anything else. This month marks a very special anniversary for the California-based independent record label Ripple Music, a venture kick started exactly half a decade ago by music-lovers and avid record collectors Todd Severin and John Rancik. In 2007, with their feet planted firmly in the field of music journalism and a website called The Ripple Effect – set up by both Severin (a former radio DJ) and Rancik (former lead singer of San Diego punk/metal band Blind Justice) – the pair became indebted to all things rock and dedicated to uncovering what they believed at the time was quite simply, “The Best Music You’re Not Listening To.” Praised by the likes of Guitar World Magazine, as one of the top music sites around it wasn’t long before their venture grew to incorporate a record label in 2010, after they were approached by legendary proto-metallers JPT Scare Band who wanted to release several previously unheard tracks from their archives. “I’d gotten to know JPT Scare Band, after writing a review of their compilation Sleeping Sickness. One thing led to another and before I knew it I was holding in my hands a series of fully mastered unreleased recordings by the band with the mandate to ‘put them out.’ With that not-so-gentle nudge, Ripple Music the record label was born,” says Todd. Since the release of JPT Scare Band’s Acid Blues Is The White Man’s Burden, and a second reissue released that same year (the 1972 album Let Me In by the cult band Poobah) the label has unearthed music of the highest order by some of the scene’s best and brightest in the world of heavy rock, psych, metal, proto-metal and doom. Mos Generator, Mothership, Stubb, Iron Claw, Trucker Diablo, Grifter, White Dynomite, Leaf Hound; this year alone has already seen critically acclaimed releases from Switchblade Jesus, Geezer, Space Probe Taurus and Ape Machine, and with highly anticipated albums on the horizon from DoctoR DooM and Sweat Lodge the label is showing absolutely no signs of slowing.